It was my fifth day in Manila, Philippines. I was so excited as it was the day I had planned to meet up with Ishmael Ahab, my Filipino blogger friend and to savour Filipino food! Since Ishmael told me he would be bringing me to a buffet lunch, I decided to skip the hotel's complimentary breakfast that morning. I also had the luxury to sleep in later which was good, as I had been waking up at 6am everyday since arriving in Manila. To my surprise, Ishmael brought me to a restaurant very near my hotel. 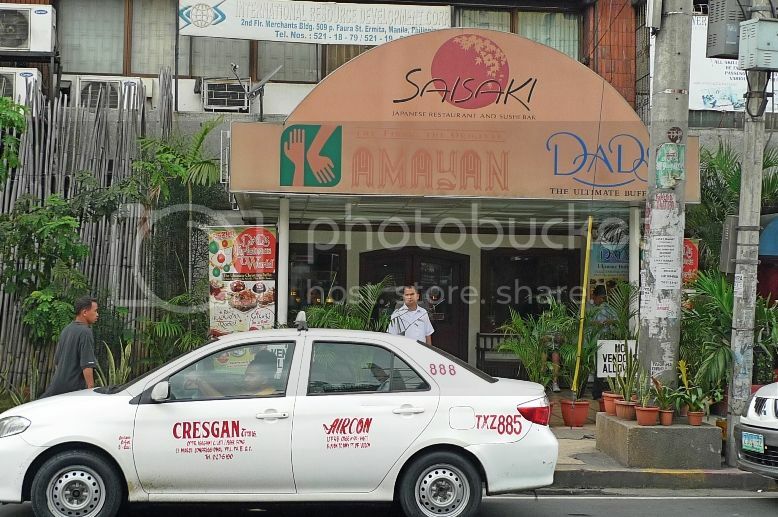 In fact, it was along the same road (Padre Faura Street) just a minute's walk away! 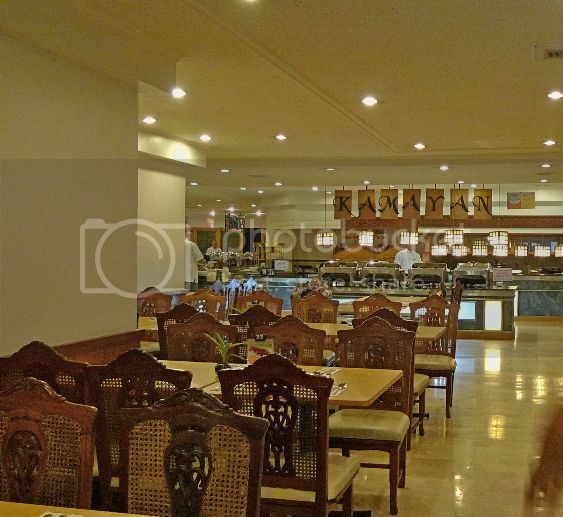 The restaurant is called Kamayan. Oh wait...it's actually called Dads, Kamayan, Saizaki. That's because it's actually three restaurants in one! 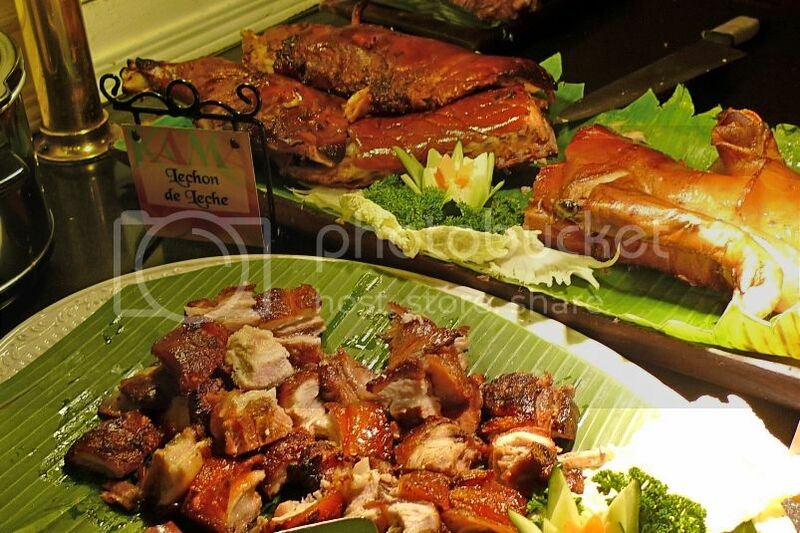 Dads offers continental fare, Saizaki Japanese specialties and Kamayan authentic Filipino cuisine. I was more interested in Filipino food so we focused on Kamayan. Kamayan is a Filipino word means to eat using hands. Not such a foreign culture as we Malaysians also love eating using our hands! But of course, in this restaurant, we were provided with forks and spoons so we did not use our hands! The photos did not turn out nice as the light in the restaurant was quite dim. 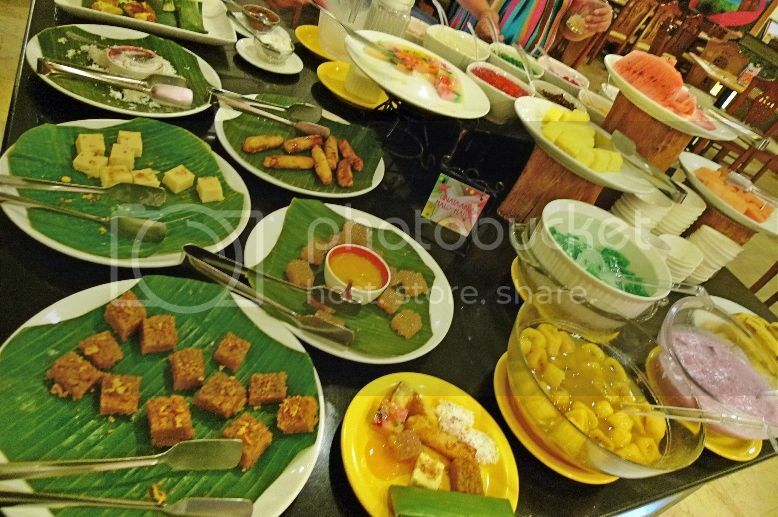 I hope you can see the pictures of the food clearly! Here are the rest of the food we ate. I am not sure if I got all the names and their translation correct! So if you are a Filipino reading this, do point out my mistakes - thank you! There were quite a variety of desserts! Please don't ask me their names! 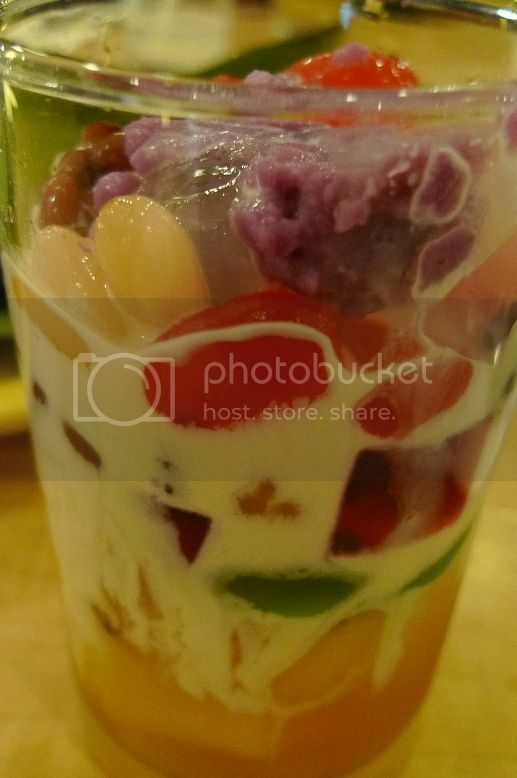 But the one I like best was halo-halo! 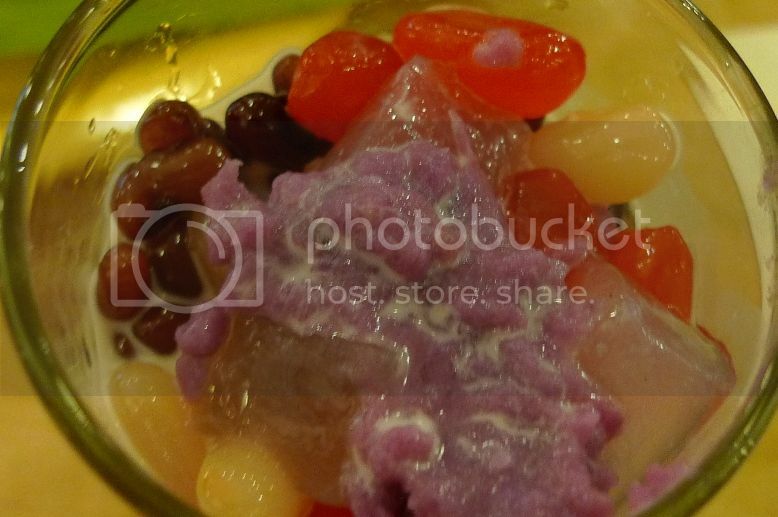 Halo-halo is a very popular Filipino dessert which is made up of shaved ice and evaporated milk and which you add into the mix various boiled sweet beans and fruits. I would say it's something like a version of Malaysia's ice kacang. By the way, the word halo means mix. 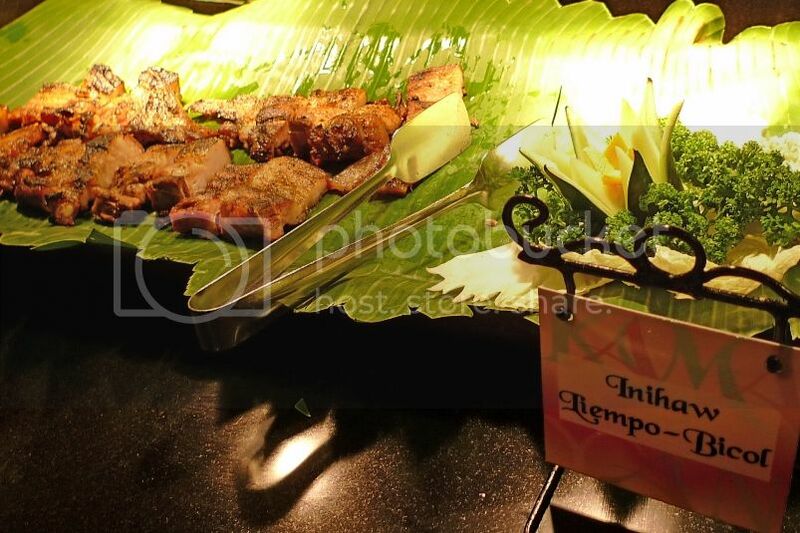 For the price of 600 pesos (RM42) per person, you can enjoy the buffet from Kamayan, Dads and Saizaki. What a great deal!!! Drinks were however, not included in the buffet price. So each of us ordered a drink (I forgot what the drink was!) which costs 200 pesos (RM14). Now that's expensive! But we were given a toy bear each! How nice! It would be nicer if they could give us a panda bear each! Haha!! Guess what? After chit-chatting with Ishmael for some time, I got thirsty and decided to order another drink. 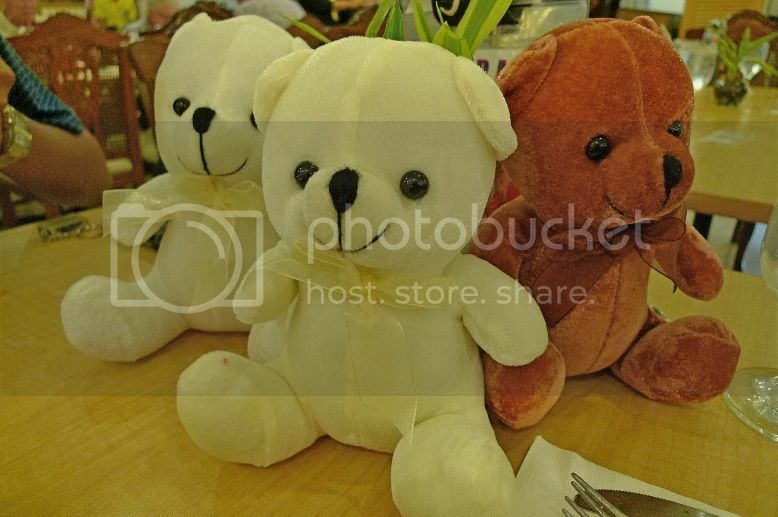 So we ended up with three bears on the table! Two whites and one brown! Haha!! 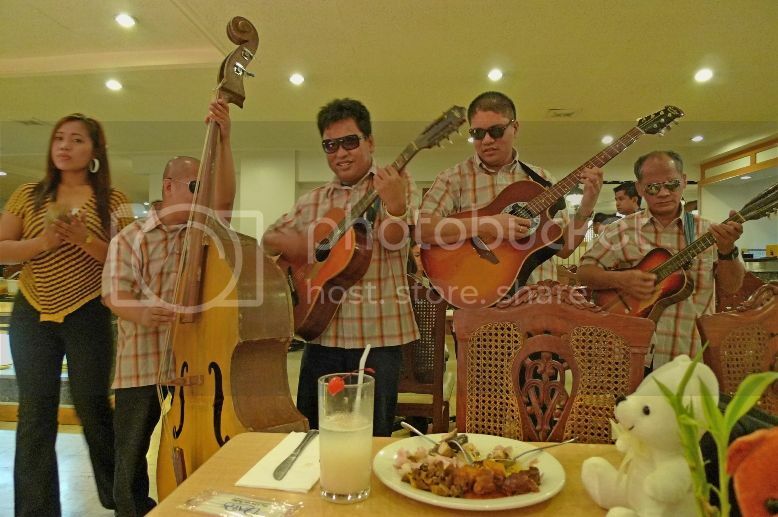 We were also entertained by a group of singers and musicians! We requested for a Malaysian song but none of them knew except the girl, so they ended up singing an English song for us! We were both quite full eating those Filipino food that we did not try the continental fare from Dads and Japanese food from Saizaki! What a waste! But it's OK, I just really wanted to try Filipino food so I got what I wanted! All thanks to my Filipino blogger friend, Ishmael! Thank you so much! Now if you are wondering why there is no picture of Ishmael, that's because like me, he values his privacy and does not like to have his photo posted online. High five to that! LOL! As we left, I took a picture of the restaurant's interior. A lot of customers had already left by that time. It was an enjoyable lunch and I would not mind coming back to this restaurant again in future! 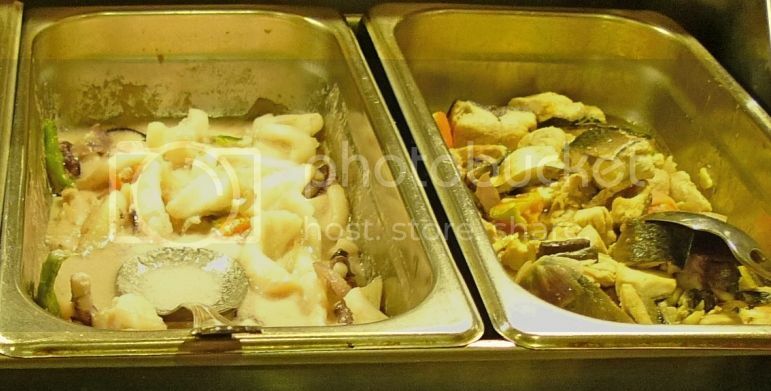 There is actually one reason why I did not want to eat too full at this buffet. Do you know what's the reason? Well, that's because right after the buffet, Ishmael would be bringing me to eat balut, which is fertilised duck or chicken egg with a nearly-formed embryo inside!